There are some great resources out there for family history and genealogy including a few inspiring TV shows, but podcasts are often ignored. Podcasts are a fantastic way of improving your research skills or knowledge. They’re easy to listen to while doing other things or even on the go around town. 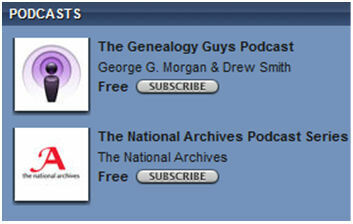 Here are some of the best podcasts available for genealogists, family historians and local historians. A great series featuring lectures, how to…, stories and much more. Also available in iTunes. Family history stories and advice. Not exactly podcasts, but very interesting. A good resource for podcasts, currently there are over 200 available with a mainly U.S. focus. Again, there are many to chose from. Literally 100s of talks, lectures and advice from many sources. I hope these resources will be of use! I may have missed one or two, so if you know of any others, please get in touch.